The food we eat has a major impact on the range and severity of our menopausal symptoms. It’s fascinating to note that Asian women have a very different experience of the menopause to Western women. They rarely experience hot flushes and night sweats and, until recently, the Japanese language didn’t even include the term ‘hot flush’. The key difference between the Western and Asian diets is the amount of plant estrogens – known as phytoestrogens – that are eaten. A wealth of research in recent years has shown that a regular intake of phytoestrogens throughout the day can play a useful part in a menopausal control programme in a similar way to HRT. In fact, although phytoestrogens are only about 1/1000th as potent as animal-based estrogen, they are fast becoming known as great hormone regulators owing to their balancing effects on estrogen levels. Here are the do’s and don’ts of the natural menopause plan diet. Eat 100mg of phytoestrogens each day. Consume foods that are rich in phytoestrogens little and often over the course of the day. Add two tablespoons of golden flaxseeds to breakfast cereal, yogurt or fruit salad. As well as being rich in phytoestrogens, they are a good source of fibre and can help constipation. They also help prevent some estrogen-dependent cancers, including prostate and ovarian cancer, and they reduce the incidence of heart problems and the bone-thinning disease osteoporosis. Eat at least five servings of fresh fruit and vegetables per day. These provide plenty of potassium and magnesium, plus small amounts of phytoestrogens. Where possible, eat organic products or grow your own. Eat foods rich in calcium and magnesium, such as milk, green leafy vegetables, unsalted nuts and seeds, wholegrains and bony fish, including sardines and whitebait. 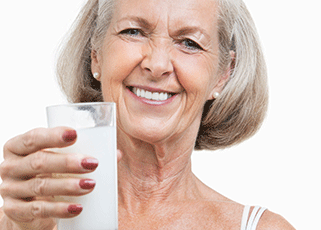 Have a serving of dairy products each day. These provide calcium and additional amounts of protein. Choose low-fat options if you need to lose weight, but avoid skimmed milk, which contains no vitamin A (semi-skimmed is preferable). Try to drink the equivalent of at least eight glasses of water daily, including herbal and fruit tea. Rooibos tea can be made with milk and is a good alternative to ordinary tea. Let hot drinks cool down, as the heat may trigger a flush. Eat three portions of oily fish per week, including salmon, mackerel, herring or sardines, which are a rich source of omega-3 fatty acids and help with hormone and joint health. Eat nutritious snacks between meals if you get hungry. Unsalted nuts and seeds, fresh fruit or dried fruit that hasn’t been dipped in sulphur dioxide are ideal. Exceed national guidelines on alcohol consumption (in the UK, no more than 14 units per week; in the US, no more than one alcoholic drink per day). Ideally, limit yourself to three alcoholic drinks per week. Alcohol aggravates flushes, insomnia and, in excess, can worsen or cause many nutritional deficiencies at a time when you need to be conserving essential nutrients. Drink endless cups of coffee and tea. Caffeine can aggravate flushes, as well as anxiety and insomnia, so choose herbal alternatives instead. Eat very heavily spiced food. Hot spices, like hot drinks and alcohol, can bring on flushes. Eat sugar and junk food, including sugar added to tea and coffee, sweets, cakes, biscuits, chocolate, jam, marmalade, honey, ice cream and soft drinks containing phosphates. They may reduce the uptake of essential nutrients, and cause water retention and bloating. 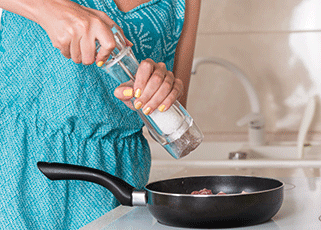 Add salt to your cooking or at the table, as we already have far more salt than we need from hidden sources. Avoid salted foods like kippers and bacon. Salt causes fluid retention and encourages calcium loss from the body in your urine. Use potassium-rich salt substitutes or other flavourings such as garlic, onion, kelp powder, fresh herbs, sesame powder or other mild spices. Go shopping on an empty stomach otherwise you may be tempted to fill your basket with the high-fat, calorie-laden foods you’re supposed to be avoiding. Eat foods containing wheat and bran in the short term if you feel bloated or experience wind or constipation. Eat lots of fatty food. Limit your intake of fats to no more than 30 per cent of your dietary intake. For most of us, this means reducing our consumption by at least 25 per cent. Avoid hydrogenated fats and anything other than small amounts of butter. Instead choose cold-pressed oils, including sunflower, sesame and safflower, as well as olive oil. Smoke cigarettes – they aggravate hot flushes and night sweats, and can bring on an earlier menopause. If you do smoke, try to pace yourself between cigarettes and cut down gradually until you can manage to quit altogether.